Do You Have A Junk Drawer or Two? Every household has a junk drawer — don’t they? My house holds furniture that has many drawers. I would have to say that most of those drawers probably hold a little junk. My husband would say they hold a lot of junk. Because I had to conveniently rearrange some of my furniture this week I decided perhaps I could do without a small stand by my bed that is comprised of three drawers. I converted part of an old vanity to a nightstand, but it wasn’t quite what I wanted in my bedroom/office. I have a hodgepodge of furniture moved from other houses, inherited from family and kept by me during remodeling because it was too good to throw away. The bedside table is in the last category. I took out the first drawer and began muddling through all the tiny pieces of this n’ that residing in the drawer. I had my “to keep” pile, my “to toss” pile and my “giveaway” pile. In the keep pile were items I didn’t know I had, and of course, they were valuable, and I certainly would use them now that I found them. The toss pile remained empty as I sorted items, deciding that some items were too good to throw and someone could use them. They landed in the giveaway pile. Did I need all the different types of glue that were in one drawer? You never know when you need super glue or just sticky-it-up-for-a-little-while glue. Did I need my old glasses from eighth grade? I didn’t know I still had them, but I now like the frames. Perhaps I should keep them and take them along when I get new glasses so I can match frames — they are back in style. I finally found the snowman hanger I had been looking for at Christmas. I should put it with the Christmas decorations. How many nightlights do I need? The grandkids don’t need them anymore. I would toss something in the giveaway pile only to pick it back up. Those pieces seemed to stick to my fingers and I didn’t even need all the glue that had been in the bottom drawer for the items to stick. I had sticky fingers caused by a sticky mind. Memories stuck in my mind kept items stuck to my fingers. Finally I picked everything up and neatly organized it back in the drawers, put the old vanity-nightstand back in my bedroom/office and decorated it with a green piece of cloth that gave my room a more finished look. I could not part with any of it. I have more junk drawers I must tackle, but if it is like the nightstand drawers, I won’t get rid of anything. I have too much sentimentality in me along with the you-might-need-that-someday emotion. On another note — I did tackle all the old cleaning supplies under my basement steps. The plan was to take them to the recycling and waste day. I thought most of the cans were empty and old and out dated. What I found was they were full and in date, and because we didn’t take the time to look for them, we bought more. We probably won’t need cleaning supplies for years. The key is to organize them and put them in a place where we know where they are. I live a scatterbrained life. I toss things in drawers instead of having a place for everything and putting everything in its place. I waste time looking for things I can’t find but know I have. I always vow to do better, but I get busy and stressed and because I multi-task, I toss things where it is convenient. It drives my other half crazy, but he does the same thing on a smaller scale in that what he tosses isn’t needed for another year or so. Will I ever change? I don’t know. 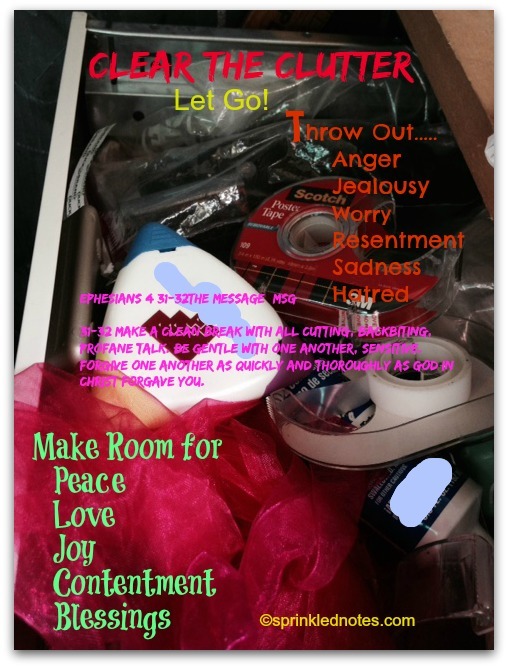 I want to, but to accomplish that I have to be able to let go of the junk in the drawer. It is hard work. Not only physical but at times emotional. It is the same with the junk in our lives that isn’t material junk. How often do we hold on to hurts, anger, resentment, sadness and hatred that get in the way of living our lives, and affect the quality of our life and our relationships? We think we let go and then we pull it back to save it for another day. Will the tug of war ever end? Only we can decide. Tags: Albert Lea Tribune, Author, Boneyard Tea and Coffee, Christmas, Cozy Cat Press, creativity, Fuchsia, Granny Hooks A Crook, Granny Snows A Sneak!, Julie Seedorf, Minnesota, Something About Nothing, Sprinkled Notes, Whatchamacallit? Thingamajig? I would love to say I only have one, but that’s just not true?!?! I have to make a plan to get organized and clear out unnecessary junk. I’m finding it way too enjoyable this summer to sit out on the deck, in the later afternoon or evening, and read. It’s my heaven on earth! Your blogs and books are just the best, Julie!